A peace pole developed by students in the art department at Mitchell High School will be on display in the lobby of the South Dakota Cultural Heritage Center in Pierre, headquarters of the State Historical Society, from Sept. 12-Oct. 10. 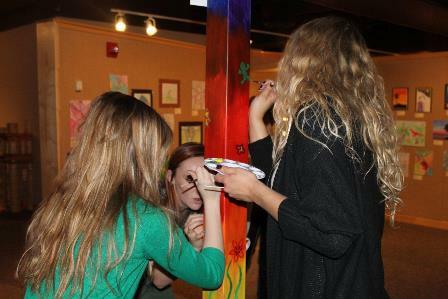 Earlier this year, the Youth Art Peace Pole Project selected Marica Shannon and her students from Mitchell High School to represent South Dakota by designing and creating a special 7-foot tall Peace Pole. Peace Poles are now one of the most recognized symbols of peace worldwide with more than 240,000 across the planet. All Peace Poles have the message “May Peace Prevail on Earth” in different languages on each side. The languages on the South Dakota Youth Art Peace Pole are English, German, Spanish and Lakota. The peace pole is part of an international project that was started by artist and teacher Masahisa Goi in Japan after the bombing of Hiroshima inspired him to live his life to work towards a more peaceful planet. Goi was inspired to spread the message “May Peace Prevail on Earth” and created the Peace Pole as a vehicle to help share that message with the world as a simple non-political and non-sectarian reminder. Today, there are roughly 240,000 Peace Poles planted in 180 countries around the world. The Youth Art Peace Pole Project was started in 2011 at the World Peace Sanctuary in New York State when thirteen art teachers and their kids created Peace Poles that looked like no other Peace Pole on Earth. On The International Day of Peace on September 21st of 2014 the Youth Art Peace Pole for each State will be displayed in the State it was created in, and all 50 states are represented. To see photos and read stories of this incredible Peace Pole and information about the others from around the country, please see the Youth Art Peace Pole Project website at www.yappp.org.